Winter greens and lettuces grow in the warmth of one of the hoop houses. A variety of fig trees are planted all around Elm Street Gardens. The Currey’s historic house overlooks garden beds. Bee hives are an important part of Elm Street Gardens, providing pollination for the crops as well as honey. Tomatoes are part of summer at Elm Street Gardens. Beautiful eggplant are another important summer crop. Butterhead lettuces grow beautifully in the winter in hoop houses. 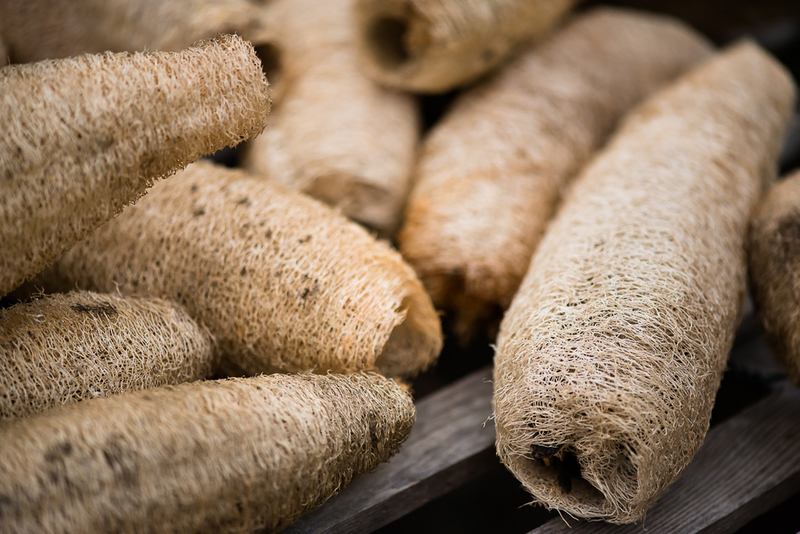 Natural loofah sponges grow in abundance in the summer garden. Elm Street Gardens is A Certified Organic Garden. We Grow Year Round Using A No-Till Method & We Never Use Any Synthetic Fertilizers or Pesticides. Elm Street Gardens began as a vegetable garden located behind a historic house in Sparta, Georgia. The gardens were begun in 2004 as an experiment to see if the Curreys, the owners of Elm Street Gardens, could grow the vegetables they wanted to eat throughout the year. The gardens have continued to expand in size, and become more productive per square foot as the soil continues to improve. Two acres around the house are being farmed with outdoor beds as well as ten hoop houses and a heated seed house for starting transplants. We are a certified organic farm, meaning we never use any synthetic fertilizers or pesticides on our property. We strive to create a healthy ecosystem with habitat for beneficial insects, birds, bats, frogs, lizards and other organisms. We rarely spray even the approved organic pesticides because they inevitably kill beneficials and throw off the natural balance of the garden. Every year the soil in our garden improves by adding rich black compost and constant mulching. The soil ecosystem, much like that above ground, depends on diversity for health and balance. By never tilling, we don't disturb the earthworms or other soil life. Our plants work with the soil life to extract the nutrients they need from the soil, much as plants do in nature, so we don't need to add a bunch of fertilizer. The result is happy, beautiful vegetables and we can not only see the difference, but taste it as well. The health of our soil directly impacts both the health of our plants and of those who consume them. Quality and taste are our results.